The Olympic Games--pushing skills, minds, brains and bodies to their limits in the ultimate competition on Earth. But once mankind has reached the stars, playing sports will travel with us. Yet galactic sports come with new challenges and possibilities. And new dangers. 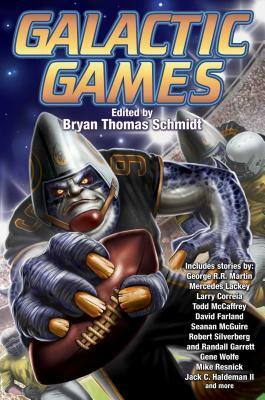 Bryan Thomas Schmidt is an author and a Hugo-nominated editor of adult and children's speculative fiction. His debut science fiction novel was The Worker Prince, which received Honorable Mention on Barnes & Noble's Year's Best SF of 2011, and was followed followed by sequels The Returning and The Exodus. His children's books include 102 More Hilarious Dinosaur Jokes For Kids and Abraham Lincoln: Dinosaur Hunter--Land Of Legends. Schmidt has edited edited anthologies Space Battles: Full Throttle Space Tales #6, Beyond The Sun, Raygun Chronicles: Space Opera For a New Age and, with Jennifer Brozek, coedited military high fantasy original anthology, Shattered Shields. Schmidt hosts #sffwrtcht (Science Fiction & Fantasy Writer's Chat) Wednesdays at nine p.m. ET on Twitter.